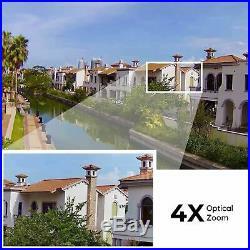 5MP PoE IP Camera Pan Tilt 4x Optical Zoom Security Cam Outdoor Reolink RLC-423. 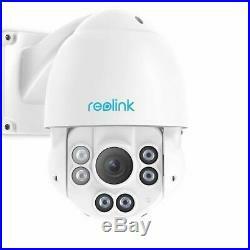 Reolink RLC-423-5MP Super HD 5-Megapixels POE IP PTZ Camera with Pan/Tilt&4x Optical Zoom (12V Power Adapter, UL, EU, UK, AU plug available). 5 Megapixels Incredibly Clear Videos. RLC-423 5-megapixel PTZ IP Camera has a pixel resolution of 3072×1728, that is, 4.5X the resolution of 1080p Full HD, and even 1.4X the resolution of 1440p Super HD. You will definitely have the best chance to see every image details as you wish. Impressive 4X Optical Zoom. Motorized zoom lens with auto-focus function in Reolink RLC-423 4X optical zoom IP camera enables a wide viewing angle (36°100°). It lets you zoom in to see more details of far-away objects without getting closer, or zoom out to get a wider and larger view. 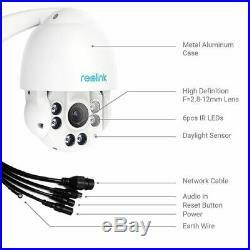 With pan function, Reolink RLC-423 PTZ security camera can rotate 360° endless horizontally at high speed. The tilt rotation at 90° makes a reliable home and business monitoring and surveillance without vertical limitations, leaving no dead area. Incredible Night Vision Up to 65m. The excellent RLC-423 night vision security camera provides you 24/7 continuous monitoring and home surveillance. 6pcs of Infrared LEDs enable a super long-distance night vision up to 190ft in low light conditions, where normal security systems fail to work. Waterproof Design for Excellent Outdoor Surveillance. 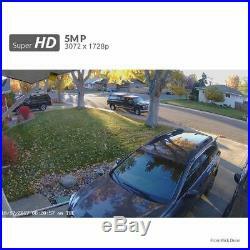 So RLC-423 PTZ outdoor surveillance camera works perfectly outside even in harsh weather conditions. An Easier, More Simplified Way to Install. Power over Ethernet (PoE) helps to transmit videos and power via just one network cable. Compared to traditional non-PoE security cameras, RLC-423 PTZ PoE IP camera reduces the number of wires, and has greater installation flexibility, which suits DIY enthusiasts. Motion Detection — The Smartest Way Ever for Alerts. 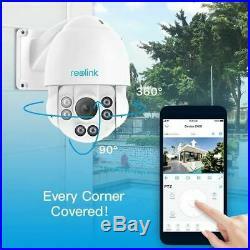 ·Whenever a danger is detected, Reolink RLC-423 surveillance camera will trigger alerts by immediately sending alert e-mails and pushing notifications to your device. It also uploads and saves captured images/videos to an FTP server. ·You can create specific motion detecting zones to monitor certain areas as you want. ·You can adjust motion detection sensitivity to reduce false alerts. Remote Viewing, Anytime, from Anywhere. 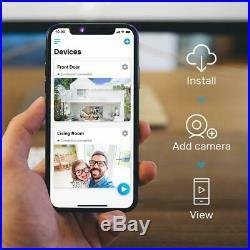 No matter where you are, you can remotely access the camera to see live streaming and stay connected. Work with NVR for 24/7 Reliable Recording. 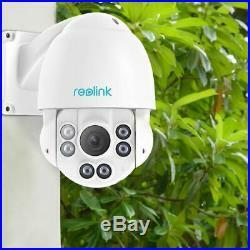 If you have multiple IP cameras or if you want 24/7 recording, a Reolink NVR is your best choice. The NVR works perfectly and efficiently with the cameras for round-the-clock monitoring and recording for your home & business security and surveillance. See it in Details. PTZ IP Camera RLC-423 Specifications. Video Quality: 5 MegaPixel (3072 x 1728). Lens: f= 2.712mm, 4X Optical Motorized Zoom, Autofocus; F=1.6. Viewing Angle: 98° at 2.7mm and 36° at 12mm. 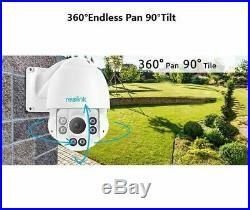 Pan/Tilt Degree: 360° endless horizontal and 90° vertical. Night Vision Distance: up to 65m. Operating Power: 12V or by POE(802.3at Standard). Power Consumption: up to 22W. POE Standard: 802.3at, 44V54V. Support up to 330ft with CAT6 cable. Network Connection: P2P and QR Code. Computer Operating System: Windows 7/8/10, Mac OS 10.9 and higher version. Handheld Device Supported: iOS, Android, 3G/4G Smartphones & Tablets. Please do not open the case for us before we offer a resolution for you. We care every single customer. Listing and template services provided by inkFrog. 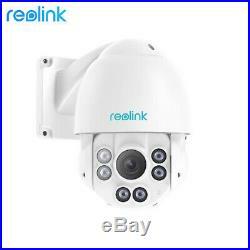 The item “5MP PoE IP Camera Pan Tilt 4x Optical Zoom Security Cam Outdoor Reolink RLC-423″ is in sale since Monday, August 21, 2017. This item is in the category “Consumer Electronics\Surveillance & Smart Home Electronics\Home Surveillance\Security Cameras”. The seller is “reolinkonline” and is located in Walton, Kentucky. This item can be shipped to United States.